Looking for symptomatic relief from mild psoriasis, dermatitis and irritated skin? 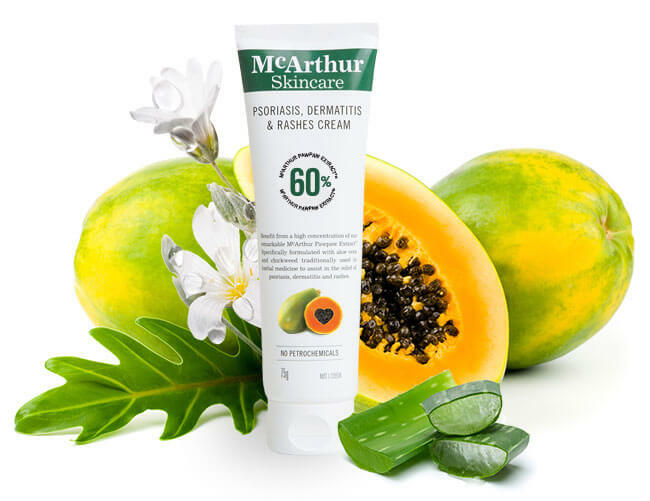 McArthur Skincare's Psoriasis, Dermatitis & Rashes Cream is a cream using the natural active ingredients Aloe Vera, and Chickweed which is traditionally used in herbal medicine for the relief of itchy, irritated and dry skin associated with mild psoriasis, dermatitis and rashes. This cream is listed on the Australian Register of Therapeutic Goods. McArthur Skincare's Psoriasis, Dermatitis & Rashes Cream contains Aloe Vera, and Chickweed which is a natural ingredient that has traditionally been used in herbal medicine and may assist in providing relief from mild psoriasis, dermatitis and rashes. Aloe Vera has traditionally been used in herbal medicine to assist with the healing of minor wounds such as cuts, burns, sunburn and minor skin irritations. Chickweed, has traditionally been used in herbal medicine as a topical ointment to assist with the relief of mild psoriasis and to assist with the healing of minor wounds and the relief of mild inflamed skin conditions and minor skin irritations such as rashes. This cream is formulated with active natural ingredients Aloe Vera, and Chickweed which is traditionally used in herbal medicine for the relief of itchy, irritated and dry skin associated with mild psoriasis, dermatitis and rashes. 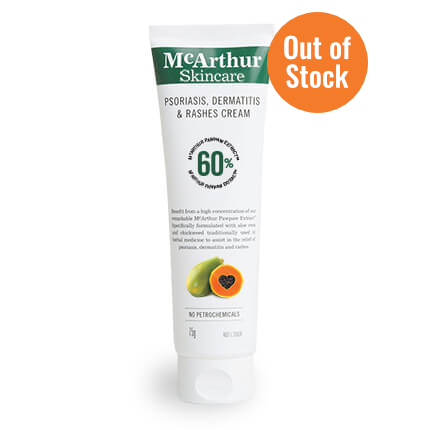 You should keep McArthur Skincare's Psoriasis, Dermatitis & Rashes Cream stored at a temperature that’s under 30° Celsius. Spread a thin film of cream on and in a wide circle around the affected area until no cream is visible. Feel a change: A mild tingling or a skin change may occur on application. Apply twice daily, morning and night, to dry skin. Patch test prior to use. If symptoms persist see your healthcare professional.